Reproduction Nathaniel Cooke 1849 Staunton Chessmen. Here’s your chance to own a set of tournament-sized Staunton chessmen exactly as they looked when they first appeared in stores on September 29, 1849! 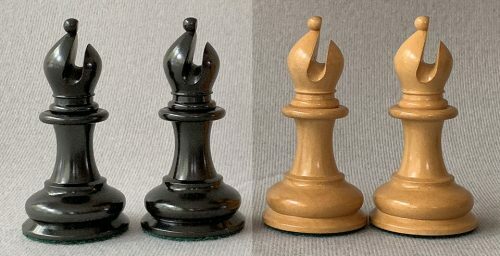 Offered here is an exact reproduction of the original Club-Size Nathaniel Cooke 1849 Staunton Chessmen, recreated by noted Staunton authority, Frank Camaratta. 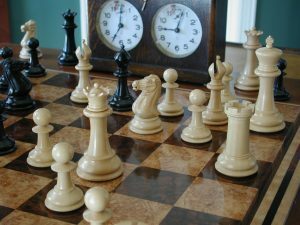 It is an accurate recreation of the very first Club-size Jaques Cooke style 1849 Staunton Chessmen, registered by Nathaniel Cooke in 1849. The images show comparisons of our reproduction Chessmen and Knights with the oldest known Club-Size Jaques Staunton Chessmen. This is a full Club-size set, featuring a 4-3/8″ King with a 1-7/8″ diameter base. The chessmen are crafted from Boxwood and Ebony and are very heavily weighted. 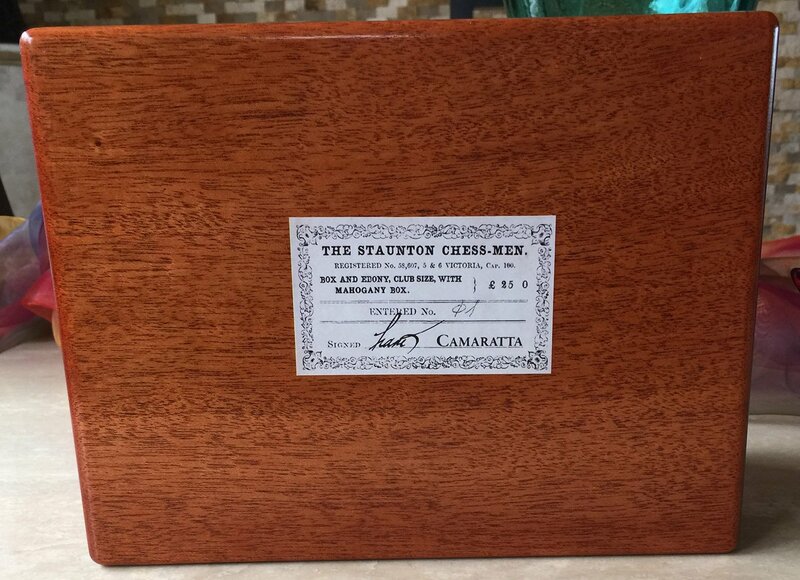 Each set of the Cooke 1849 Staunton chessmen is cushioned atop green English baize base pads and housed in a Premium, lined and divided Mahogany box. These Cooke 1849 Staunton chessmen are accurate – right down to the impression of a red king’s crown on the summits of one Knight and Rook. This convention was suggested by Staunton in 1842 to designate the Kingside Knight and Rook. 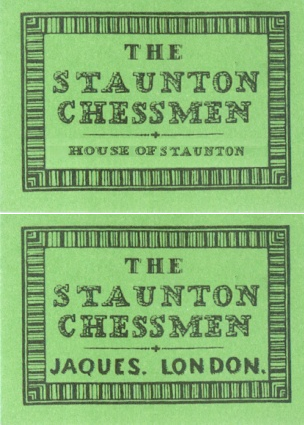 The box itself features an accurate facsimile of the small green Staunton Chessmen label on the underside of the lid. A facsimile hand-signed manufacturer’s label is affixed to the underside of the box. The box features a brass plated keyhole cover and semi-mortise lock and key set. 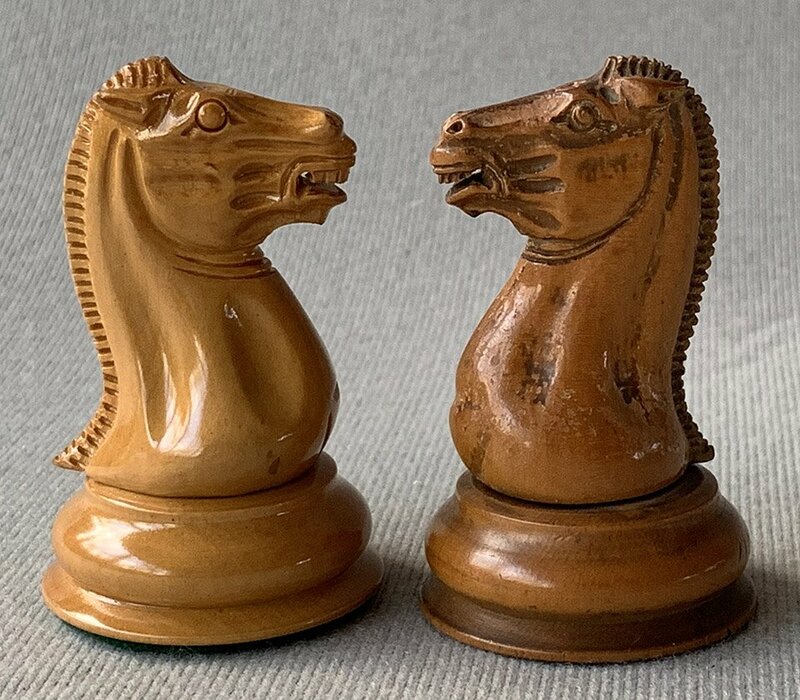 The Cooke 1849 Staunton Chessmen are new. Each set consists of 34 Chessmen, including four Queens. This innovation was introduced by Frank over 25 years ago. 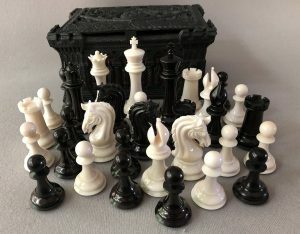 These chessmen can also be purchased in either Antique and Black Lacquered Boxwood or Ebonized Boxwood finishes for $495. Please indicate your choice when ordering from the website. The Ebonized and Lacquered finished chessmen will be accompanied by a $100 rebate after the order is placed. A reproduction of the chessboard that was offered by Jaques in 1849 is also available. 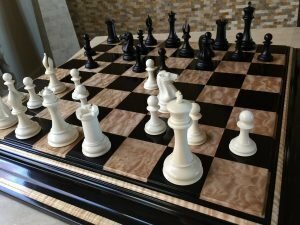 To see this board, along with our extensive collection of new and antique chessboards, please click here. 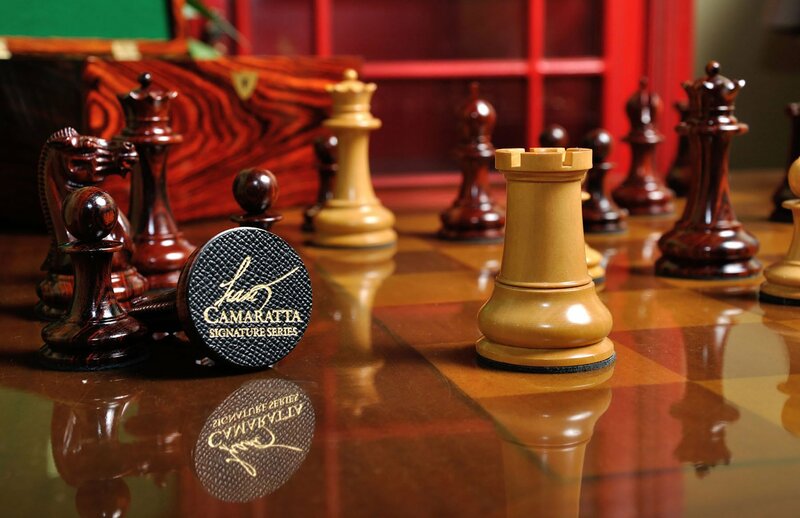 The Staunton pattern chess pieces are the World standard for serious and casual play. The relatively low production cost brought chess to the masses and did much to popularize the game. Its clean, simple design has never been equaled – the original design looks as modern today as it did upon its introduction over 166 years ago. 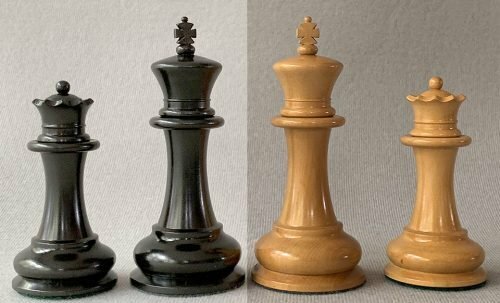 Some useful information on collecting the original Jaques Staunton chessmen can be found by clicking here. 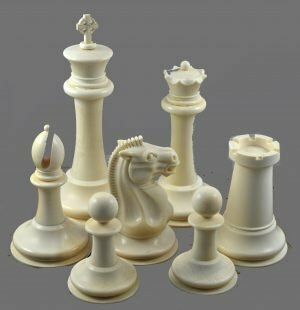 For a brief history of the John Jaques Company and the Staunton Chessmen, click here. In 1849, this new design was revolutionary. 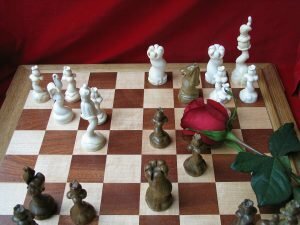 It was simplicity and elegance, However, this upstart met with some resistance from the established Chess Clubs and many players. Here are some insight into the ideas behind this new design. The inspiration for the Staunton Knights is derived from the noble steeds whose visages are captured in the Parthenon frieze. These sculptures were expropriated between 1801 and 1812 by Thomas Bruce, 7th Lord of Elgin. They have since been referred to as the Elgin Marbles. The distinctive, finely detailed Knight head, seen pulling the Moon Goddess Selene, is the hallmark of the Staunton design. The headpiece of the Bishop was intended to represent a flame. However, unlike earlier Bishop designs, the Staunton Bishop’s wide-open mitered headpiece was designed to more accurately convey the intended “tongues of fire”, which, in Christianity, represents enlightenment imparted by the Holy Spirit. That feature becomes evident as you examine of of these finely crafted pieces. Contemporary Bishop designs have lost that original connection. The Rook design is self-evident. The Kings and Queens are represented by their respective headpieces resting atop plush pillows. The Pawn is said to represent the Freemason’s Square and Compass, a rather obscure reference and one which is open to some debate. 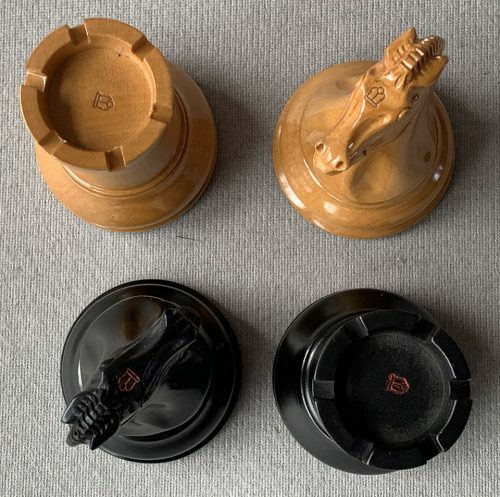 The design of our 1849 Cooke Series Chessmen embodies the intended form, board presence and craftsmanship of the original Staunton pattern Chessmen. 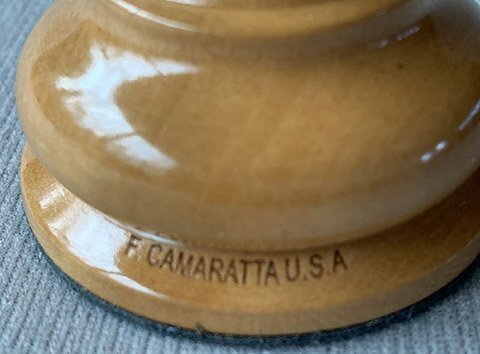 The House of Staunton has recaptured the essence of these magnificent Chess pieces and made them available on a very limited basis at a price well within the reach of most players and collectors. 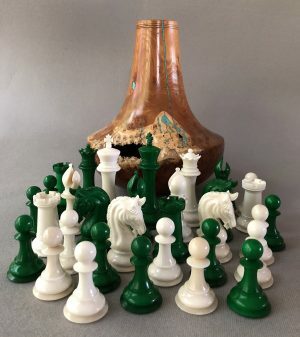 These reproduction Cooke 1849 Staunton Chessmen have been designed to withstand the rigors of practical play while maintaining an elegance which has become the hallmark of a House of Staunton chess set. 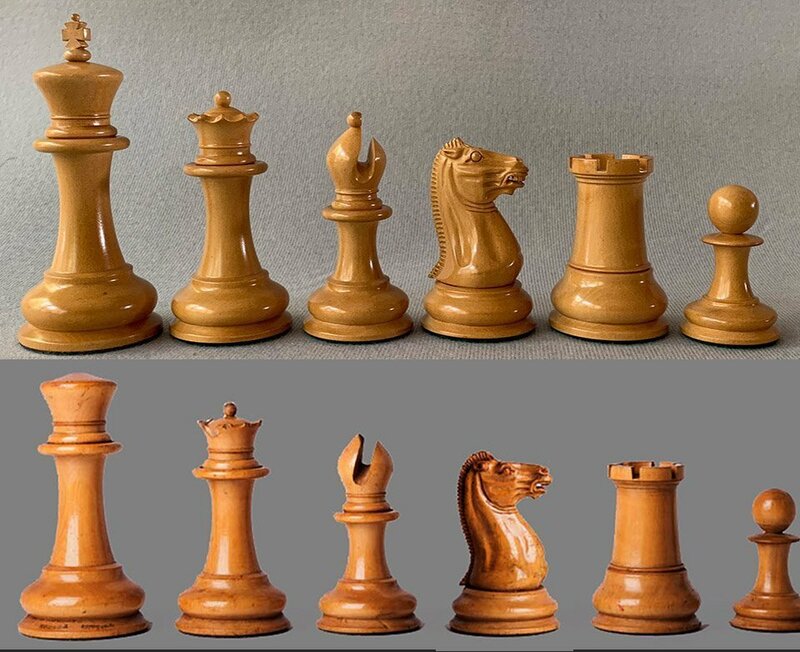 The Knight heads for these impressive chess sets are hand-carved by our master sculptors, using the highest grade woods. The design, accuracy, quality and craftsmanship of this set is UNMATCHED by any set of Chessmen at any price. Nothing even comes close! The House of Staunton name is now recognized World-Wide as synonymous for quality and exquisite design – the chessmen for those with exquisite taste. The perfect gift for the man or woman who has everything. They are so well-respected that they even made the comics!